World champions Australia sounded a stern warning to their rivals as they thumped New Zealand by seven wickets in a Group A league match today and entered the semifinals of the ICC Champions Trophy. 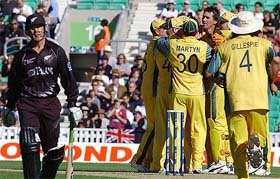 Australian players celebrate the dismissal of New Zealand’s Nathan Astle during their ICC Champions Trophy match at the Oval in London on Thursday. An under-fire International Cricket Council has defended the inclusion of weaker teams for the Champions Trophy, saying such exposure was vital for the minnows. With a long-drawn legal battle looming over the contentious telecast rights, the Board of Control for Cricket in India today rallied behind its President Jagmohan Dalmiya, authorising him to take necessary action in all matters. Blood drips from the forehead of Swedish referee Anders Frisk after an object thrown from the stands hit him during the Champions League soccer match between Roma and Dynamo Kiev at the Olympic Stadium in Rome on Wednesday. A night of drama in the Champions League ended with AS Roma's abandoned match against Dynamo Kiev overshadowing Bayer Leverkusen's stunning 3-0 upset of tournament favourites Real Madrid. An allround display by skipper Ankur Kakkar (6 for 59 and 72 n.o.) helped Ludhiana surpass Minor Districts Zone B total in the last league fixture of the Inter-District Katoch Shield match at the Satish Chander Dhawan Government College for Boys ground here today. Reetu, a national player from Hoshiarpur, was declared the best boxer in the fifth Senior Punjab Women’s Boxing Championship which concluded at Guru Nanak Stadium here today. Second-seeded Sunil Kumar Sipaeya finally found an easy meat in former national junior champion Jaco Mathew as he recorded a 6-1, 7-6 (4) victory to sail into the semifinal of the Indian Oil ITF Men's Futures Tennis Tournament at the Delhi Lawn Tennis Association deco-turf court here today. Ajeetesh Sandhu tightened his grip on the Category A title of the Chandigarh Junior/Subjunior Golf Tournament returning a one-over card of 73 today for a three-round score of 211 today. This was 12 strokes better than the second-placed Gaganjeet Bhullar. Guru Nanak Dev University maintained its supremacy in sports by lifting the Maulana Abul Kalam Azad Trophy for the year 2002-03 for a record 18th time. Punjab Technical University will give university colours to sportsmen, said Mr S.K. Salwan, Vice-Chancellor, while talking to this correspondent at Baba Banda Singh Bahadhur Engineering College, here, recently. The Kiwis, put into bat, were blown away by an accurate new ball spell by Glenn McGrath and were restricted to 198 for nine in another ball-dominated match in the 12-nation event at the Oval here today. McGrath cleared any doubts over his ankle by claiming three for 39 even as he bowled eight overs on the trot in his opening spell. He was well supported by Michael Kasprowicz, who justified Ricky Ponting’s decision to leave out express pacer Brett Lee by grabbing three for 32, besides taking a well-judged catch in the deep to end Brendon McCullum’s counter-attack towards the closing stages. McCullum’s top score of 47 off 66 balls and his 68-run stand for the ninth wicket with Daniel Vettori (29 not out), New Zealand’s highest against the Aussies, lifted the team from 124 for eight in the 36th over but the target was too little to defend for the bowlers. Matthew Hayden made a cautious 47 while Damien Martyn’s well-crafted 60 not out set up the launchpad for the explosive Andrew Symonds to tear into the Kiwi attack with an unbeaten 71 that contained seven fours and four sixes. Earlier, Ponting won half the battle when he called the coin right and put New Zealand in on a pitch with a fair bit of moisture. Stephen Fleming and Nathan Astle provided the Kiwis a brisk start but McGrath struck his first blow in the seventh when he had Astle (18) leg before. Three balls later, in his next over, McGrath rapped Hamish Marshall on the pads to send back the right-hander for no score. And when the New South Welshman, who had been out of the national side for more than eight months earlier this summer, had Scott Styris (0) scooped up by Michael Clarke at point, the New Zealand top order had once again failed against their arch-rivals. Bowling: McGrath 10-0-39-3, Gillespie 9-1-46-1, Kasprowicz 10-1-32-3, Watson 6-0-32-0, Symonds 10-2-29-0, Lehmann 5-0-16-1. A series of heavily lop-sided games in the first half of the Champions Trophy has led to cricketers, notably Australian skipper Ricky Ponting, and former players like India's Kris Srikkanth question the rationale behind inclusion of minnows in the big league. But ICC spokesman Brendan McClements disagreed and said exposure was vital for weaker teams. "I think it's important those countries are able to aspire to and test themselves against that level," McClements said. "They will get a lot of cricket among themselves that will improve their cricket and there will also be some targeted funding towards the higher performing associate members. So, I think, as this structure takes root over the next two years, we'll see the benefits of that by the time we get to the 2007 World Cup," he said. Meanwhile, the line-up for the first ICC Intercontinental Cup semifinals is ready with Scotland playing the African qualifier and Canada meeting the Asian topper in November this year. The UAE will host the three-day semifinal matches from November 16 to 18 and the title-decider two days later, an ICC note said here today. Pakistan coach Bob Woolmer and former Pakistan batsman Rameez Raja made the draw yesterday. Scotland will play either Kenya, Namibia or Uganda in the semifinal in Abu Dhabi, depending on the outcome of the Kenya vs Namibia match in Nairobi from October 1 to 3. The Malaysia vs UAE match in Kuala Lumpur on September 17 to 19 will decide on the contender for the Sharjah semifinal against Canada. With a long-drawn legal battle looming over the contentious telecast rights, the Board of Control for Cricket in India (BCCI) today rallied behind its President Jagmohan Dalmiya, authorising him to take necessary action in all matters. 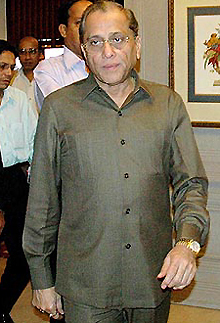 The working committee, which held an emergent meeting here, discussed at length the developements arising out of the legal tussle between ESPN-Star Sports and Zee Telefilms Limited and decided to maintain status quo on the issue of telecast rights for matches to be played in India during next four years, as per the directive of the Bombay High Court. The court had yesterday told the BCCI not to award contract to any third party for cricket telecast rights until it decided the legal dispute between Zee and ESPN-Star Sports. With regard to the ongoing legal proceedings, the committee decided to advise the board lawyer to assist the court for expeditious disposal of the matter. The committee also discussed the platinum jubilee match between India and Pakistan scheduled to be held on November 13 in Kolkata, which is beyond the purview of the present television tender. It authorised Dalmiya to take a decision on broadband rights for international matches and telecast rights for the one-day exhibition match between India and Pakistan here on November 13. In a fresh development in the legal battle over telecast rights of cricket matches, SAB TV today moved the Bombay High Court urging for intervention in the matter. SAB TV, a 24-hour entertainment channel, filed an intervention application saying that ESPN-Star Sports had failed to satisfy the consortium criteria as mentioned in the tender bids called by the Board of Control for Cricket in India for telecast rights of cricket matches to be played between October 2004 and September 2008. SAB TV counsel Ram Jethmalani argued that Espn-Star Sports should have protested against the bid process at the time of opening of bids itself after realising that Price Waterhouse Coopers (PwC) was just tabulating the figures mentioned in the bids and was not looking into the eligibility of the parties. He also mentioned that ESPN-Star Sports should show whether they are themselves qualified and only then question the eligibility of Zee Telefilms Ltd.
Jethmalani pointed out that ESPN-Star Sports were foreigners and did not have to pay taxes in India and their venture was totally commercial. ESPN-Star Sports counsel Iqbal Chhagla argued that the BCCI had found his client 'unqualified' as they did not "own the in-house production facilities as required under condition 3.2 of the tender floated by the cricket board." He said the BCCI, in its affidavit filed before the court, had found both ESPN-Star Sports and Zee Telefilms Ltd unqualified in terms of owning a production facility. 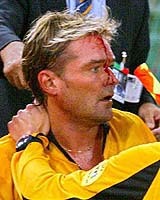 The group B match between Roma and Kiev at the Olympic Stadium was called off after Swedish referee Anders Frisk was felled with blood pouring from a head wound after an object thrown from the crowd hit him at the top of his forehead. The unsavoury incident happened as Frisk was walking off the pitch at half time and followed the sending off of Roma's Philippe Mexes moments earlier after the French defender had kicked out at Kiev striker Maris Verpakovskis. Frisk (41) showed him a red card on the stroke of half time with Kiev leading 1-0. As players and officials remonstrated, Frisk was hit by what appeared to be a cigarette lighter. Rome's Olympic Stadium already held unpleasant memories for the Swede. In March 2002 he refereed Roma's Champions League match against Galatasaray, which degenerated into a brawl involving players and officials from both sides shortly after the final whistle. Also in group B, Bayer Leverkusen scored one of the biggest upsets in Champions League history crushing Real Madrid 3-0 to end a seven-match losing streak in the competition. A miserable night for Real ended with the news that playmaker Zinedine Zidane dislocated a shoulder and will be out for three weeks at least. It was Real's biggest European defeat for four years and means they have won only once in 20 European matches in Germany. Manchester United, like Real possible title contenders, also looked like capitulating to a shock defeat but recovered from 0-2 down to draw 2-2 at Olympique Lyon in their group D opener. Lyon led with goals from Cris (35th minute) and Pierre-Alain Frau (45th) after some poor defending but United struck back in six second-half minutes with two goals from Ruud van Nistelrooy, who broke Denis Law's European club record of 28 goals. Juventus won the battle of former final rivals when they beat Ajax 1-0 in Amsterdam in group C thanks to a brilliantly taken chipped goal from European Player of the Year Pavel Nedved three minutes before half time. Bayern Munich, the third former European champion in group C, also made a winning start with another Dutchman on target. Striker Roy Makaay made no mistake with a second-half penalty that spoilt the festive occasion in Tel Aviv where fans chose to celebrate the first Champions League match played in Israel rather than stay home and celebrate the start of the Jewish New Year. Another former European champion to enjoy a good start were Liverpool, who proved far too strong for last season's beaten finalists AS Monaco in group A at Anfield where Djibril Cisse and Milan Baros scored brilliantly-taken goals. Minor Districts Zone B (1st innings): 160 all out in 59.2 overs (Sumit Kumar 43, Jagjit Kumar 24, Jaswant 31, Abhinav 25; Ankur Kakkar 6 for 59, Karan Goel 3 for 36, Ashish Sehgal 1 for 31). Ludhiana (1st innings): 162 for 4 in 33 overs (Ankur Kakkar 72 n.o., Gagandeep Singh 27 n.o. ; Amrinder Singh 2 for 54, Gurdeep Singh 1 for 76). Patiala: Overnight rain played spoilsport on day one of the Katoch Shield league match between Patiala and Chandigarh at the Dhruv Pandove Stadium here on Thursday. The two umpires, Des Raj and Parminder Singh, both from Ludhiana, made several inspections of the pitch and finally at the stroke of tea called off the day’s proceedings. Patiala, who have been grouped with Minor Districts A, Mohali and Chandigarh, have garnered five points after two matches. If the first innings is not completed tomorrow, as is being expected, Patiala and Chandigarh will get a point each. Amritsar: Amritsar’s medium pacer Varinder claimed five wickets against Jalandhar in the Katoch Shield league match at Gandhi Grounds here on Thursday. Batting first, Jalandhar were bundled out for 78 in 37 overs. Except Manik Kohli (18), Vivek Mahajan (12) and Ishan Malhotra (11), no other batsmen could reach double figures. Chasing the target, the hosts lost four wickets to reach 110 off 32 overs. Opener Manish Sharma was stumped for 50 while Ravneet Ricky scored 25 runs. Jalandhar (1st innings): 78 all out in 37 overs (Ishan Malhotra 11, Vivek Mahajan 12, Manik Kohli 18; Varinder 5 for 26, Charanjit Singh 3 for 12). Amritsar (1st innings): 110 for four in 32 overs (Ravneet Ricky 25, Manish Sharma 50, Chandan Madan 19 n.o.). Hoshiarpur won the overall championship by securing 23 points followed by Patiala and Sangrur with 19 and nine points, respectively. Rekha Dutta of Patiala was adjudged the best loser. The results: Reetu (Hoshiarpur) b Khushdeep Kaur (Sangrur) 12-3, Surinder Kaur (Patiala) b Mandeep Kaur (Ropar) 29-15, Preeti (Jalandhar) b Seema (Hoshiarpur) 21-6, Meenakshi (Patiala) b Priya (Hoshiarpur), Sandeep Kaur (Sangrur) b Navita (Hoshiarpur), Naveeta Grewal (Hoshiarpur) b Rubby (Hoshiarpur). Sunil will take on fifth-seeded Vinod Sridhar in the semifinal. Vinod Sridhar disposed of third-seeded Vishal Uppal 7-5, 6-3. Kamala Kannan ousted fourth-seeded Aqeel Khan of Pakistan in straight sets 6-1, 7-6 (5). Kannan will take on Chris Kwon of the USA in the other semifinal. Kwon defeated Sanam Singh 6-4, 6-1 to keep alive the foreign presence. The lush course of the Chandigarh Golf Club also saw Fatehbir Dhaliwal surging ahead. He also had an impressive 11-stroke lead over Rahul Bakshi in Category B. The scores after the third round in Category B were Fatehbir Dhaliwal 223, Rahul Bakshi 234 and Amanjot Singh 237. In Category C Akash Vats shot a 10-over card of 82 to retain his lead. His nearest rival, Raghav Bhandari was six strokes behind after the third round. In Category D Virat Badhwar shot a 10-over card of 82 today and stole the lead over yesterday’s leader Ainesh Ahluwalia. The Vice-Chancellor, Dr SP Singh, will receive the trophy and a cash award of Rs 2 lakh from the President, Dr APJ Abdul Kalam, on September 21. The trophy, named after the first Education Minister, was instituted in 1956-57 and is awarded to the university displaying all-round best performance in sports. During the period the university were winners in softball (men and women), handball (men), cross-country (men), kho-kho (women), korfball, netball (men and women), football (women), weightlifting (men), powerlifting (men) and judo (men and women). It was runners-up in table tennis (men), hockey (women), yoga (women) and cycling (women). The university finished third in yoga (men), handball (women), lawn tennis (women), gymnastics (women) and weightlifting (women). Dr Salwan said students who would participate in international and national level would be given the university colours. He said a sports calendar had been finalised and the university was making efforts to promote sports and cultural activities.